Birmingham based Capstone Development has been developing high-end student housing for the last 15 years. Partnering with universities they have brought their unique style of student living to both large and small campuses in every state. 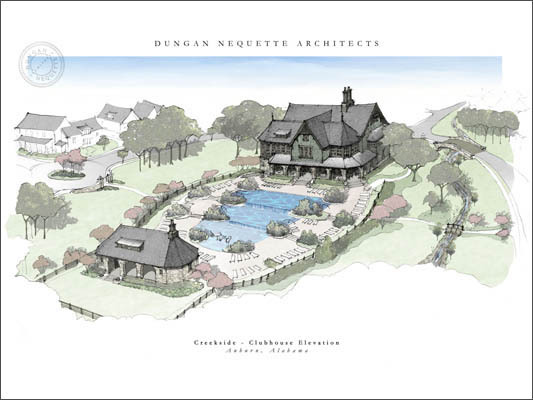 Their most recent venture is the development of a 52 acre student “village” in Auburn, Alabama called Creekside. Creekside will redefine student living by creating a community of cottages surrounding a 5 acre park complete with a clubhouse, pool and trails. Nimrod Long and Associates has designed the site masterplan, park masterplan, entry wall, pool, site amenities, and landscaping for this exceptional student community in Auburn. Currently NLA is also working with Capstone on 5 other sites being planned in Alabama, Florida, Tennessee, Mississippi, and Missouri. NLA won a 2008 ASLA (American Society of Landscape Architects) Alabama Merit Award for Creekside of Auburn in recognition of their Outstanding Professional Achievement for Landscape Architectural Services. Creekside of Auburn has also won the Multi-Family Award of the Year 2007 Student Housing Award.